I thought I would share some little finishes of my own from last year. I have grown to love little quilts and whipped up a few simple ones when I had a couple of hours to myself. 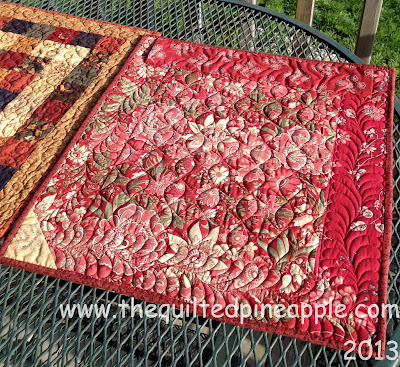 Literally, with a couple of hours I pieced AND quilted 2 little quilts!!! Redville. I will explain later where the name comes from. I am in LOVE with precut mini charms!!! 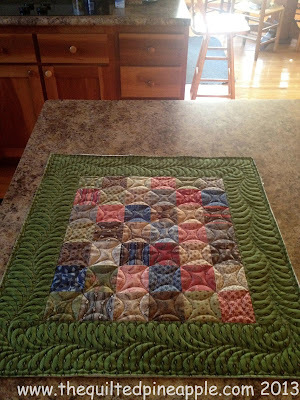 I used a single Candy Pack (2 1/2" precut charms) of Moda's Metropolitan Fair by Barbara Brackman and less than a fat quarter of Jo Morton for the border and binding. It has been bound, washed and dried in this photo. It finishes at around 18"x20" and the borders are around 3" finished. I also double batted. I cannot remember what combo of batting I used though!!!! This is what happens when I wait 7 months to blog about it!!! I know at the time I was experimenting with the look of different batting combos. I love feathers! 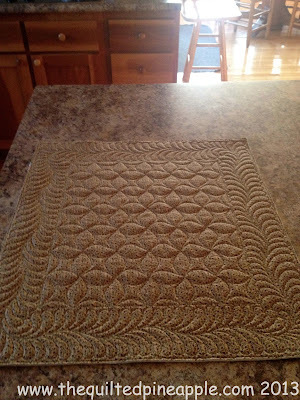 Feathered border really dresses up an otherwise simple quilt. The back. Again, just a fatquarter I had in my stash. I even have a little label and hanging sleeve on it!!!! I was really on top of my game that day!! Here is an inside photo. 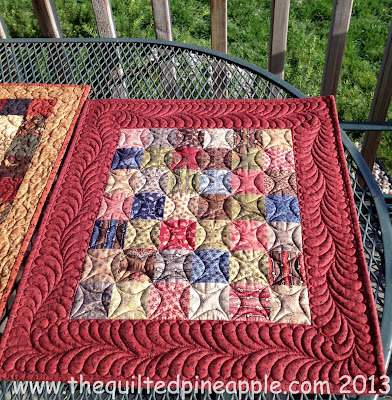 The sun really makes the fabric take on a brighter red. 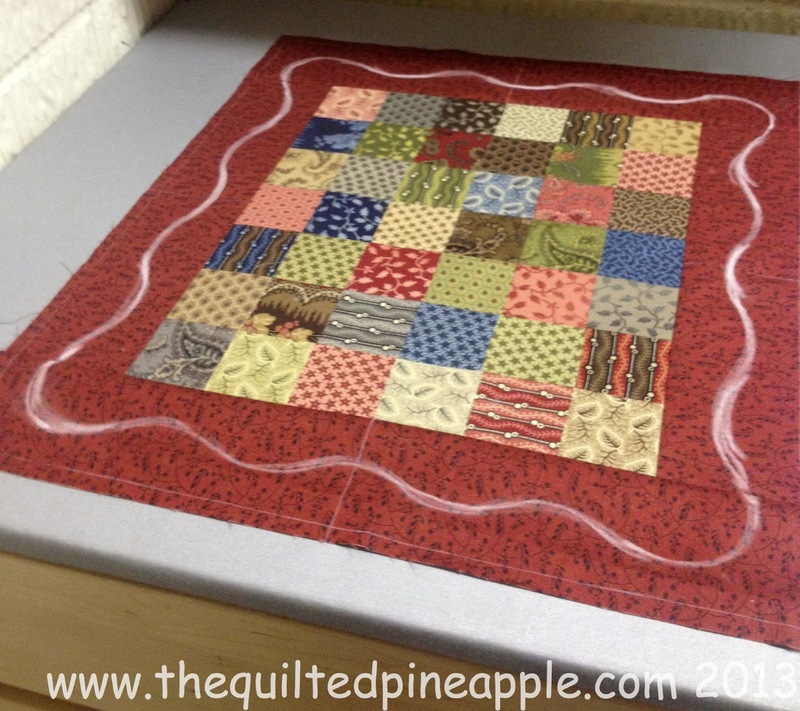 Here is a before quilting pic. I just freehanded the spine with white school chalk. I also found the center on my borders and my binding allowance. That way even though the spine is freehand, it has some balance. This little beauty hangs in the mudroom. 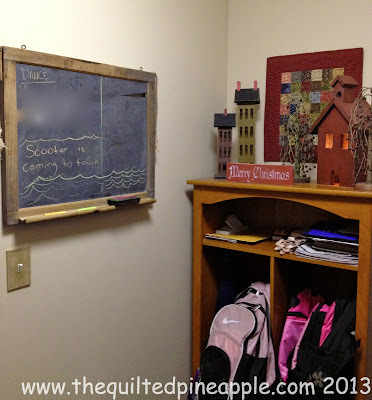 Surprisingly, that chalkboard is my favorite in the mudroom. It was given to me by my very dear friend, Patti. 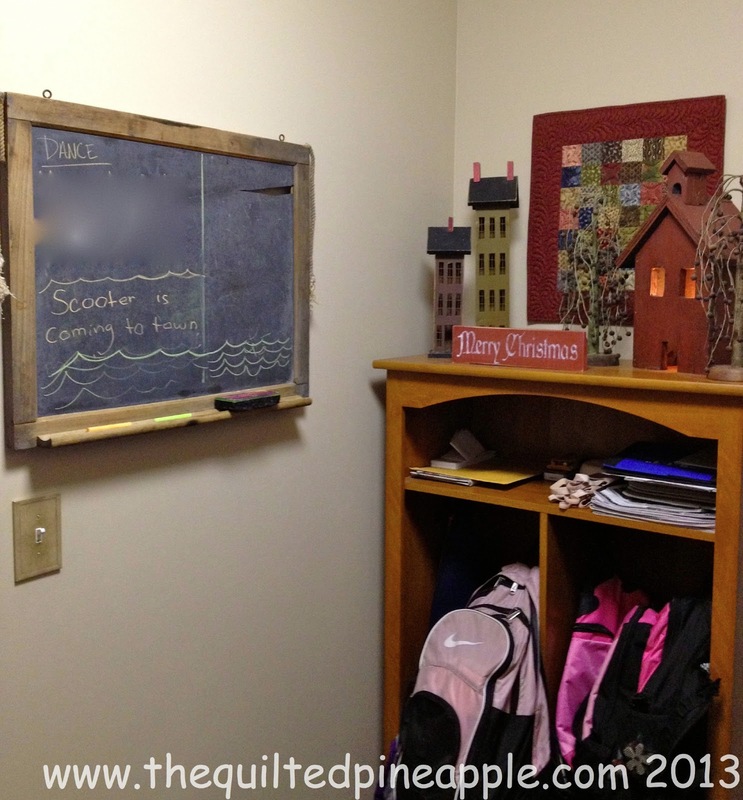 I had been in search for a chalkboard for the mudroom for some time (thank you Pinterest). A place to keep messages and the girls' dance schedule. This old chalkboard came from Patti's farm. She says she remembers it even as a little girl hanging in one of the barns. It was where they would write cattle feeding or medicine schedules for the animals. At some point, the rope and the chalkboard part broke. Patti brought it to me and thought I could swap the chalkboard part out and use it. Well, upon close inspection and cleaning it, I realized the chalkboard was a solid piece of slate. The back side was rough. I asked Scott if he could "glue or something" it back together. And he did!!! I wanted to keep it as close to its original form as possible. Hence there is a little piece missing and the broken rope is still attached. Scott securely attached it to the wall cuz it weighs a ton. As you can see, the girls like to leave little notes too. :-) I feel very fortunate to have such a sentimental gift from my friend. Oh the show isn't over yet! Redville has a twin! Greenville! LOL. Greenville is actually the original. The back. I forgot to take pics of it all washed and bound before I sent it off on its travels. You may see Greenville if you go to the Primitive Gatherings Booth at a show. Greenville is on a national tour!!! I spotted Greenville in Lisa's latest blog post here. 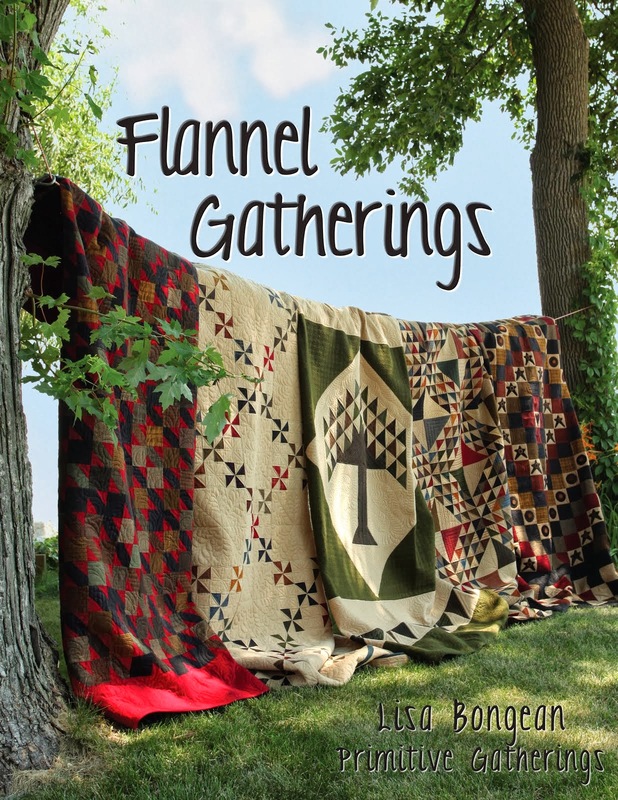 Primitive Gatherings has an amazing selection of reproduction precuts here. 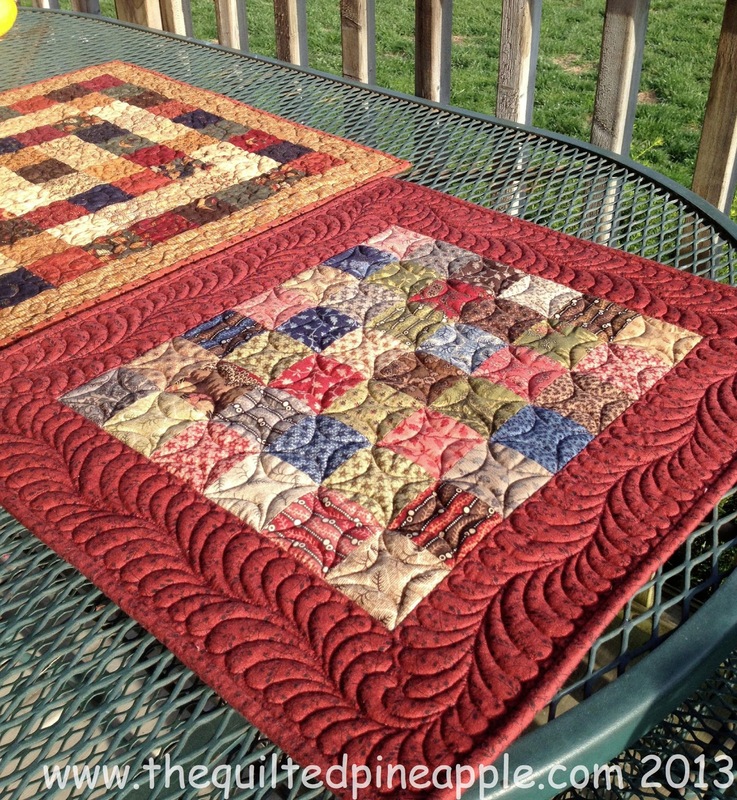 Both quilts are a great examples of making a little quilt with some precuts and fabric. A couple of hours later, you have an awesome mini quilt or 2!! How adorable and I think the names are very fitting. Twins just like your girls! I love your little quilts, especially the quilting! Wonderful! 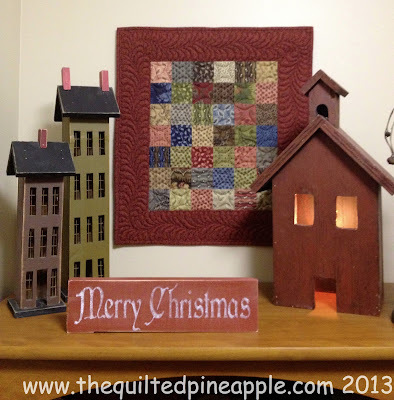 Wonderful quilts, love making minis to hang around the house. I really love your chalkboard, really nice piece to decorate around. Very beautiful quilts, Linda! I love the chalkboard too. How nice of Patti to give it to you. That is a nice story behind it. So I'm wondering. Why two battings? 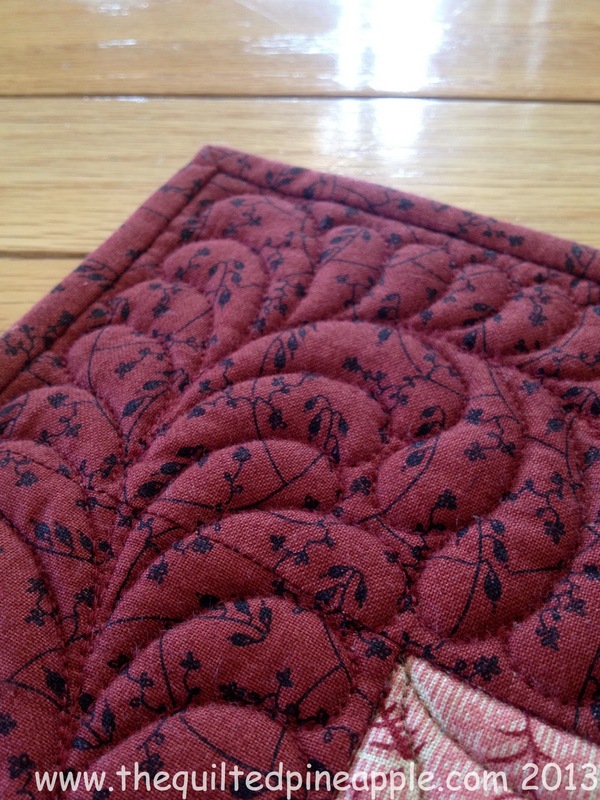 Is that what makes the quilting 'pop'? Love your little quilts! Fabrics are great and the quilting is exceptional! Love the minis. Certainly a gorgeous and terrific way to experiment with batting. Clever. I heart, heart, heart feathers. I think if I had a mudroom there would really be mud in there! Beautiful and I think the chalkboard is fun and special. Those mini's are adorable! 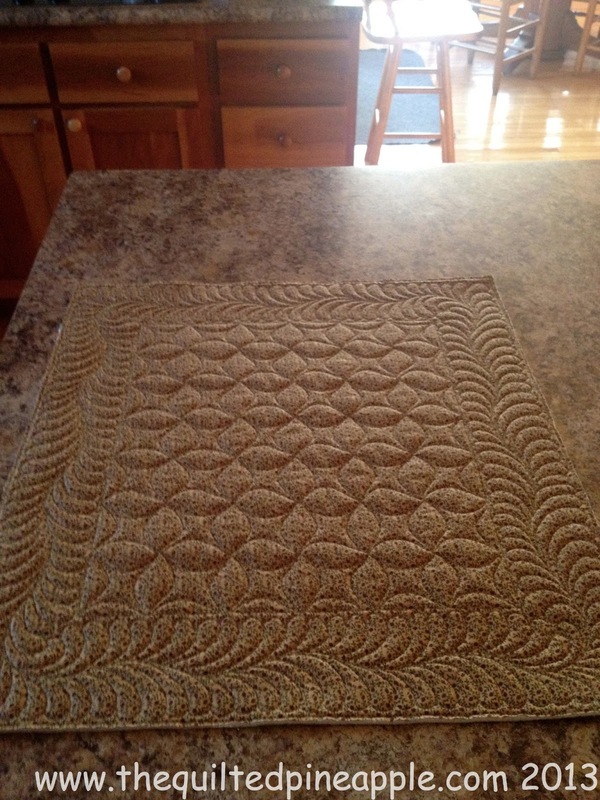 I love how you quilted them. You probably don't remember me, but I attended the wool workshop with you at Primitive Gatherings in Oct of 2011. You do amazing work! I love the feather work you do. 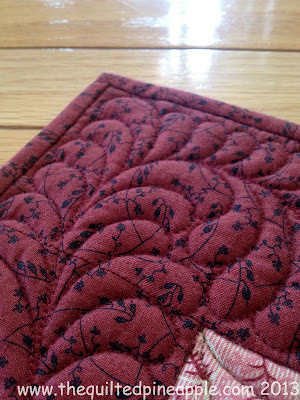 The feather border quilting is very nice. A good design choice. 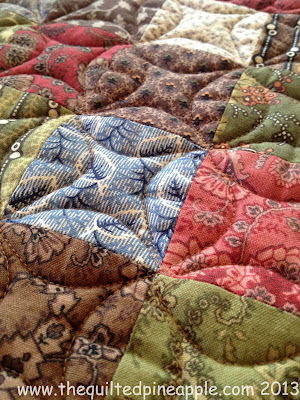 I wish I could whip out machine quilted feathers like that. Love all the minis...great job!! The chalk board is wonderful...great idea! Have a wonderful day! 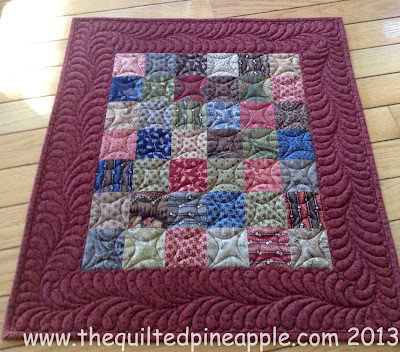 Oh, that is lovely again, I have to keep making little quilts like these as presents in the back of my mind... although that quilting.....that will be quite different :-)! 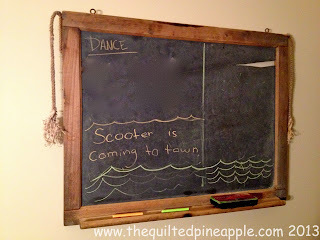 Love the chalk board, love those old things that were really used in the past, it looks great. Your feathers rock!!! Your little quilts are so sweet. The blackboard is a great idea. 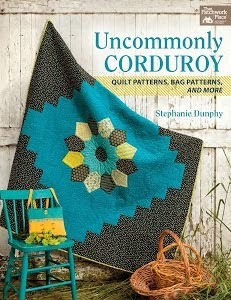 Those tiny quilts are fabulous! Your feathers are just gorgeous! 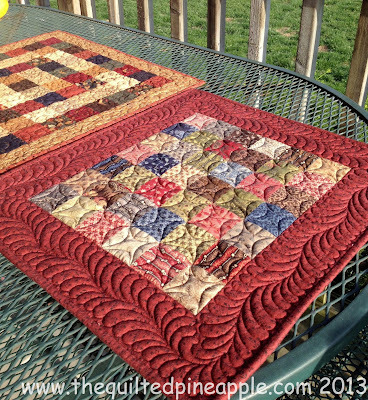 Great little quilts and like that they each have a different name....how cute. Good to see you're coming up for air and even taking a break with Bugs and the girls, Linda! You're too funny! 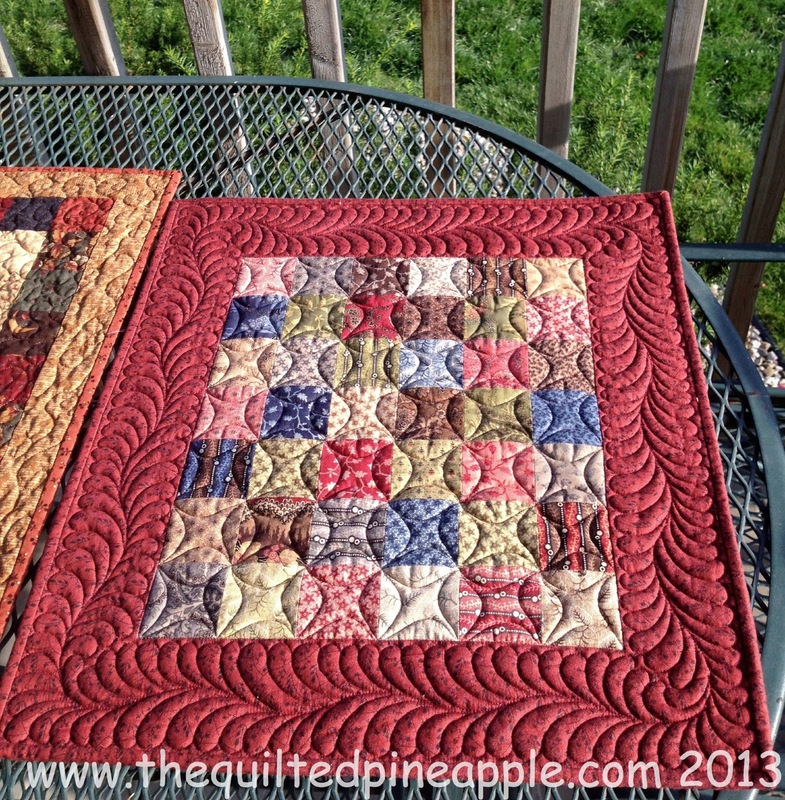 Love the little quilts - you sure gave me the bug! Can't wait to see what you're working on!